Wheaton, Illinois – the Du Page County Fairgrounds will again host the nationally acclaimed “Chicagoland” Civil War, Collector Arms, and Military Show and Sale on Saturday, April 27th,2019. Early buyers may come at 8:00 am. Admission is $25.00. General Admission is 9:00-4:00pm. Admission is $9.00 and free for youths 16 and under. Parking is free. Customers will be greeted by the Battery H-First Illinois Light Artillery members. 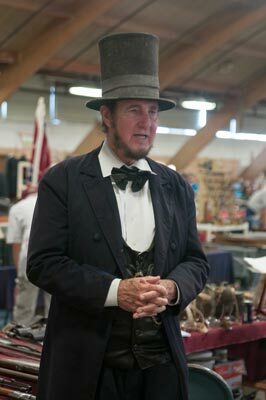 Upon entering the show, you will cast your eyes upon museum quality artifacts and other items for sale and show from the Civil War, Revolutionary War, the Indian Wars, and recent war eras, along with vintage and collectible arms. Dealers are coming from far and near across the US. Young and old will be able to visit with our President Lincoln. Come to shake his hand. He certainly will put a smile on your face young and old. Customers may also participate in a trivia contest. Mr. Don C. White historian, author, and lecturer will be present to test your knowledge, share his expertise, and engage in some old- fashioned conversation. We hope you are able to join us for an informative and enjoyable day.